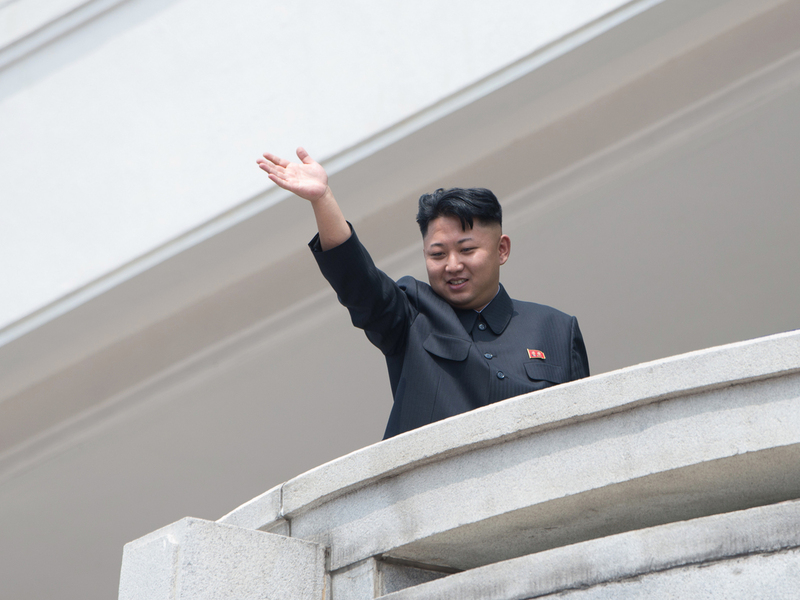 Defectors Think Most North Koreans Approve Of Kim Jong Un : The Two-Way A survey shows that most of them believe three meals a day has helped boost the leader's popularity, despite the country's continued economic woes. North Korean leader Kim Jong Un. Mr. Popularity? While public opinion polling hasn't exactly caught on in North Korea, a survey of defectors estimates that more than half of the country they left behind approves of the job leader Kim Jong Un is doing. Seoul's Institute for Peace and Unification Studies, as reported by Yonhap news agency, asked 133 defectors to hazard a guess as to Kim's actual approval rating in the country, which at least publicly buys into the absolute cult of personality surrounding its leadership. Just over 60 percent said they think most of the country is behind him. In a similar survey in 2011, only 55 percent believed Kim's father and predecessor, Kim Jong Il, had the support of the majority of the country. "Experts put Kim Jong-un's popularity down to efforts improve everyday citizens' lives, with an emphasis on economic growth, light industries and farming in a country where most are believed to be short of food, Yonhap says. There are no opinion polls in the closed communist state, where — outwardly at least — the leader enjoys full and boisterous support. Though not directly comparable, the perceived approval rating outshines those of Western leaders. A recent McClatchy poll suggested only 41% of Americans back President Barack Obama's performance, while UK Prime Minister David Cameron scored 38% in a recent YouGov poll." "The new leader seems to be tightening his grip, with 45% saying society is tightly under control, up from 36% in the previous report. Anti-regime leaflets and graffiti are a bit less common (but maybe that's the high approval rating at work): 66% of the latest group said they'd seen such things, down from 73% in the 2012 survey and 70% in 2011. Travel to other parts of the country has become more difficult. The percentage who reported having done so, after rising for five consecutive years—to 70% among the defectors interviewed in 2012, from 56% among those interviewed in 2008 — retreated to 64%."